There is currently a growing trend for doggy tech across the UK and when we saw Pet Touch ID’s tags we were immediately drawn to them. Not only do they look like normal dog tags unlike many of their competitors but they are also unbelievably cheap! Their basic range start at just £8.95 and their premium tags, like ours, start at £9.95 which I’m sure you’ll agree is great values for money. We have been unable to find a similar product for a lower price on the UK market; most are more expensive and look very “tech-y” whereas the Pet Touch ID tags just look like normal dog ID tags from the front which we love. 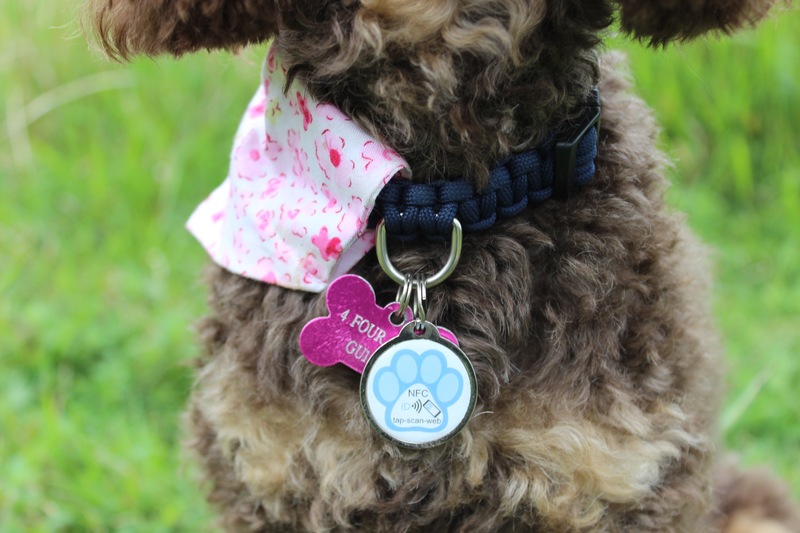 The Pet Touch ID tags come in a range of very smart designs and colours, Rhapsody has the Custom Paw Smart Pet ID Tag in pale blue and mine is the Red Smart ID Tag with a cute paw print design. Both are from their premium range of tags. They are slightly bigger than the tags that are normally on our collars, about 2.7 cm across, and pretty heavy when compared to a standard aluminium tag but this would only be an issue for a very small dog. Rhapsody is 5.1 kg and she is fine with hers. Let’s get into the nitty gritty. The tags work by using a QR code/contactless NFC tap when the unique code on the tag is scanned on a mobile phone it uses the phone’s GPS to send you the location of the phone and therefore of your pet. Your human receives a notification as soon as your tag is scanned, even if your human didn’t even know they had lost you yet! There is no app for the Pet Touch ID tags so anyone with a smart phone can scan the QR code/contactless NFC tap and send the GPS location. We tested this and found that, although it did not give you an exact location, it was accurate to about 20 meters by which point you would hopefully be able to see or hear your human. When the tag is scanned your human’s contact details will come up on the users screen along with any other vital information that you have included on your profile. This can include information such as allergies or medical details both of which could be lifesaving in an emergency situation. Your human, should the worst ever happen and they lose you (which would be very careless), can change your status on our profiles to “Lost” on your profile and this will immediately alert the person that scans the tag as to the location from which we went missing and the time that we were last seen. This could be information vital to reuniting you with your humans. At this time Pet Touch ID tags cannot be worn in the place of a traditional tag in the UK by law. The law states that all dogs must wear a tag with at least their human’s surname and postcode on it and there are possible fines of up to £5000 for breaking that law. We would recommend wearing both a regular tag and a Pet Touch ID tag. Anything that could help reunite lost pets with their humans more quickly is a winner in our books.Overall we think these tags are a great product and would highly recommend them. Thankfully our humans have never lost us but if they did then they’d feel confident that they have done everything possible to be reunited with us as quickly as possible. In case you are still on the fence, here is a summary of the pros and cons of the tags. Woah I just came here to read all the new posts and this one just popped up. 😀 Nice timing. These look good and I was looking into getting a type of tracking tag for mine just in case my two decide to go walkies alone. We’ve been pretty impressed. For £8.95 you can’t really go wrong! These seem great! Nice review, we hopefully will pick one up in the near future and use it on Bonnie’s harness as she doesn’t have any tags on that yet, just the one on her collar.